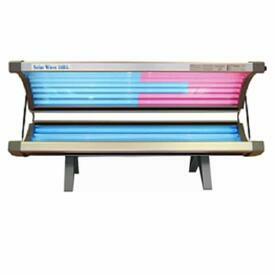 Solar Wave Tanning Beds for Sale with Free Shipping Nationwide from Family Leisure! Bring home an efficient and powerful source to clear up complexions, combat Seasonal Affective Disorder and provide beautiful bronze skin! This impressive line of products arrive with free shipping anywhere in the continental United States and delivered 98% assembled. Each bed is both efficient and powerful with specially designed body, face and arm tanner lamps. The lamps themselves hold energy-saving Fulham electronic ballasts, which use 40% less energy than the typical lamp. We promise these models will offer lower electric bills than the regular old style and not only do they focus on energy consumption, but their innovative designs and concepts ensure a comfortable tanning experience. Bells and whistles that typically come with a cost through other manufacturers are standard here. Get ready for a wonderful experience in the privacy of your home with Solar Wave Tanning Beds.